Federal employees who worked on the Obama administration's policies are worried about retaliation from the Trump team. Photos courtesy of the Department of Energy and Gage Skidmore via Flickr. A Trump transition memo asking for the names of government staffers who attended climate change meetings is sending shock waves across the workforce. 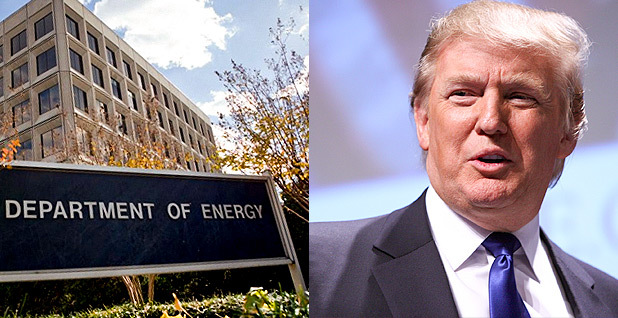 Employees in energy and environmental agencies — many of whom are already wary of how a Trump administration will deal with their work — were even more nervous last week after seeing a list of leaked questions from the Energy Department transition team. That list included queries about which DOE staffers attended international climate change talks and interagency meetings about estimating the benefits of climate change policies. Now, staffers at other agencies are fearful that the incoming administration will target employees who worked on climate change policies or other Obama administration efforts opposed by President-elect Donald Trump. "This is something like a witch hunt, it's just absolutely ridiculous," said John O'Grady, president of a national EPA employee union. Another EPA employee who spoke on background called the DOE memo "an ominous sign." EPA staffers "are wondering if it's confined to DOE," that person said. "No one likes to see federal employees treated that way." Yet another longtime EPA career employee said of the memo's impact, "It's a chilling effect on all government employees and it inhibits any whistleblowing and it makes employees who carry out policies of the government at risk for retaliation if there's a change in policy." One of the questions on the DOE transition memo asks for a list of DOE employees or contractors who have "attended any Interagency Working Group on the Social Cost of Carbon meetings." Another asks for the names of employees or contractors who attended any of the U.N. Framework Convention on Climate Change meetings in the last five years. Those were among a list of 74 questions being circulated by the transition team (Greenwire, Dec. 9). Current and former agency employees say it's unusual for a presidential transition team to ask those types of personnel questions, and some are fearful that it means high-ranking career staffers could be punished for the work they did to advance the Obama administration's policies. "The transition period is a sensitive period for the career employees because they're anxious about the changes that are about to occur," said David Hayes, who was deputy Interior secretary during the Obama administration and worked on the Obama transition team in 2008. "Antennae are particularly up if there's any sense that career civil servants will be targeted," he added. "Some of those questions certainly suggest that they might be. Why else would you be asking for the names of particular employees that attended meetings on certain subjects?" Hayes said that the line of questioning seems troubling for agency scientists. "There were great concerns in the Bush administration about scientists being asked or told what they could say or couldn't say, changes to wording on scientific documents dealing with climate change and, in the case of the Interior Department, endangered species," he said. "I'm sure that at other agencies — particularly science-based agencies — their employees are concerned about this." Bob Sussman, who also worked on Obama's transition effort before serving as a top EPA political staffer, said the Obama team "didn't do anything like that" in 2008. "We never thought of the transition as a way to zero in on specific people who did specific things in the outgoing administration," Sussman said. A career DOE employee said transition leaders from each office in the agency are preparing responses to the memo, and nerves in the department have been frayed further by news that Congress and Trump are seeking ways to relax rules on firing civil servants. "At least there is some comfort in knowing that transition teams are members of the public and therefore not able to access sensitive information," the staffer said. "But if the appointees are as openly hostile to the Obama administration policies as the transition team seems to be [as evidenced by the questionnaire], then we are in unchartered territory for the next four years." A former Obama administration official who asked not to be named said the transition team could make career employees leery of carrying out a Cabinet secretary's agenda. "They may be setting up a culture in which the civil servant employees are looking around at what Trump wants to do and thinking, 'What happens to me if a Democrat wins the next election?'" the official said. Sussman said there's a "hostile mindset" on the part of the Trump EPA transition team, comprising "people who historically have been highly vocal and highly critical of the agency, and they seem to have a mindset of rooting out and eliminating all of the things about EPA that they don't like." Trump's EPA team includes several well-known critics of climate science and prominent foes of the Obama administration's climate change policies. "I would be worried that individuals serving at the agency might be at some career risk if [Oklahoma Republican Attorney General Scott] Pruitt is confirmed and the EPA transition team does its work and there's a very hostile, disapproving attitude toward the historical role of the agency," Sussman said. Philip Angell, a former Republican EPA staffer, said assembling staffers' names is reminiscent of the early days of the Reagan administration, when Anne Gorsuch Burford was selected to lead the agency. The late Burford was widely criticized by EPA staff, and ultimately resigned amid a scandal involving the Superfund program. Angell worked as chief of staff to Bill Ruckelshaus — EPA's first administrator under President Nixon, whom Reagan hired to head EPA again after Burford's resignation with an eye toward calming the waters at the rattled agency. Burford was known for creating an "us-versus-them atmosphere" and for keeping a "list of people they were concerned about," Angell said, including those considered "untrustworthy people" inside the agency. "The whole idea that you walk in and distrust the people that you're going to rely on to carry out your policies within the agency," Angell said, "can be very problematic." Angell said "you didn't see this coming in" with other past Republican EPA leaders, including Ruckelshaus; George W. Bush Administrators Christine Todd Whitman and Mike Leavitt; or George H.W. Bush's EPA leader, William Reilly. There are civil service protections in place to protect federal workers if they feel they've been the victims of political reprisals. "They're in place to safeguard employees against reprisals or arbitrary personnel decisions, so if this leads to a whole bunch of people being removed from their jobs and dispatched to other jobs which are marginal in the agency and this is reprisal for working on the policies of the outgoing administration, I would think that that would be an issue," Sussman said. O'Grady of the EPA union said he and his colleagues will be watching closely for any perceived acts of retaliation. "We would definitely fight back. There's no question," he said. "That would be a line in the sand for us."